There are currently 13 entries in the Services and Procedures wiki. The wiki works tentatively, anyone who wants to register or improve a service entry can subscribe, new user registrations are approved by the administrators.. This wiki is a knowledge base that is continuously enriched with new public sector services and processes. It was developed by the Open Society Organization (GFOSS), under a framework agreement between the Region of Western Macedonia with the ICCS and the cooperation of the GFOSS (Group of Open Government) and operates according to its model (see crowdsourcing) as well as wikipedia, see the best entries in Greek wikipedia. Public servants who are responsible for the delivery of the services offered by their administrative unit document in the wiki all procedures followed until the complete provision of each service. the registers maintained for its provision. The best entries of diadikasies.gr you will find here. Are there about 5,000 public sector services and procedures that we aspire to include in this wiki? The Wiki software we use is the basis of Wikipedia's largest online encyclopedia and the Wikipedia of the Greek-speaking Encyclopedia? 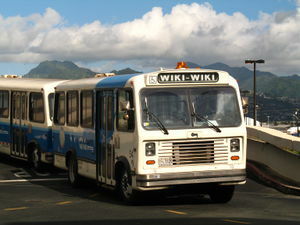 The word wiki comes from the homonymous Hawaiian word, which means fast and it was on the buses that transported people to Honolulu airport? Ward Kenningham's inventor of wiki gave this name to the software he created? The service-wiki wiki serves the following purposes: Know who is interested in how many and what services a provider provides and how. To help each operator to standardize their services so that the same service has the same name and is provided with the same procedure everywhere. Be a first big step towards simplifying public procedures. Simplification will save resources for the public and for the citizens. In the wiki we aspire with the active participation of active citizens and public employees to register and update all services provided by all public sector bodies, Ministries, Regions, Municipalities, Legal Entities of Public and Private Law. The new division according to the program "Kallikratis". Each color corresponds to a region. 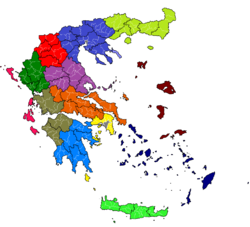 By black line are divided the regional units (except Attica), with the white municipalities (except the urban complexes of Athens and Thessaloniki). The wiki community aspires to include all Public Employees and Active Citizens who are interested in registering and improving Public Sector services and procedures. This page was last edited on 16 December 2018, at 20:59.